American Auto-Matrix (AAM) of Export, PA, develops and manufactures a complete family of microprocessor-based, applied networkable controllers. AAM products are used in a broad range of applications including facilities management, building automation, temperature control; direct digital control (DDC), process control, integrated fire, access control, and life safety management. The Controlsoft® KeyMaster® family of access control products range from entry-level single door controllers, to enterprise-level building management systems. It is based on CS-Net 2-wire ARCNET communications between the AC-4101 system controllers and host PC. Using EIA-485 communications, up to 16 devices can be monitored and controlled via a single twisted-pair communications cable. The KeyMaster access control system controllers link card reader controllers and clocking stations to PCs running KeyMaster Pro access control and building monitoring software. The Front/Desk visitor/employee management software allows for remote management of employees and visitor badges, access control templates and employee/visitor location tracking. It is networked to the KeyMaster Pro Server PC via Ethernet. Joseph Marian, Director of Technical Services and Product Management, said the access control system is PC-based. "We can interpret this to mean that the software that drives the system's advanced features must be initiated, and the ARCNET communications must be physically connected between our proprietary ARCNET card and the system controllers that make access control decisions, for these advanced features to be readily available." The access control advanced features include Visual Alarm notification (at the PC), macro operation, advanced zone control, and custom access control events. Marian said while the PC-based architecture has been a standard across the access control industry, customers needs and project specifications are changing. He states that customers are requiring more distributed control. "Where all the decisions of the access control system are made at the controller level instead of the PC level. Since we do not have a completely distributed controller as yet, we need to ensure all features and functionality of our system is available over a potentially large network. In addition, we are also seeing multi-building and remote buildings (buildings not in the same general location) needing to be tied together and managed from a single location. We have sites that are 40 miles from one another and other projects that are up-coming involving the need to be able to communicate between nationwide facilities." These larger enterprise-type projects forced the expansion of the reach of the architecture without extensive and costly development. However, AAM ran into an issue with distances. The Controlsoft KeyMaster 2-wire ARCNET backbone has a maximum distance near 1,200 feet (366 meters). This distance is adequate for most single building applications, but it can become a hindrance in multi-building applications with distances of more than 1,200 feet, to maintain the system functioning with all the advanced features provided by the current architecture. Marian said that AAM desired to "Bridge the Gap" so to speak and extend the distance of the ARCNET network. AAM looked to Contemporary Controls as the solution-provider. Marian had been familiar with the company for eight years. He used the company's ARCNET components to construct a controller communication network at his last job and it was successful. Marian continued by saying that ARCNET was important in this application because it enabled AAM to establish an "online" access control system and utilize all of the advanced features of the access control system controllers and KeyMaster Pro Server software. Marian said the AI-SRVR is designed with two other features that make it beneficial for AAM's use. These features included its compact size (5.4" W x 6.1" H, 137 mm x 155 mm) and multiple operating voltage capabilities. The small size of the units was beneficial. "Since there may be multiple AI-SRVR's installed on a job, the small size makes it easier to install multiple units in a panel or rail-mounted in proximity to the AC-4101 system controllers," he said. "While I have never personally installed any AI-SRVR's on an actual jobsite, I would assume that IT managers would be glad to see the smaller size of the units since there will be times that the AI-SRVR's would need to be placed in IT closets or within close proximity of the Ethernet switches. And the multiple operating voltage feature was ideal for this application since there may be different operating voltages used for various control systems within a facility. This would allow the potential to "steal" power from a transformer/power supply that is not necessarily used in the implementation of the access control system, preventing the need for additional power supplies. He added that by employing the AI-SRVR, AAM did not have to rush to develop a completely new TCP/IP-only architecture which would have resulted in new communication stacks to be written, software to be updated and new TCP/IP hardware to be engineered. Marian concluded that the KeyMaster system could become a very large control network and allow for expansive access control as indicated by the diagram below. 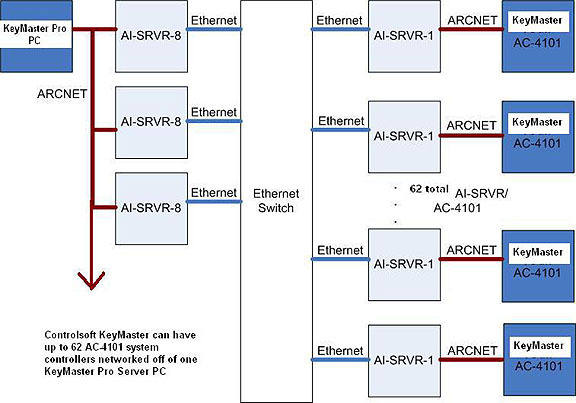 As the diagram illustrates, there is one KeyMaster Pro PC with a proprietary standard PCI ARCNET card that is connected to either an AI-SRVR-8 or AI-SRVR-1 (depending on the number of AC-4101 system controllers in the architecture) which communicate over Ethernet to an AI-SRVR-1 which is connected to one AC-4101 system controller. Its capability allows a maximum of 62 AC-4101 system controllers to be networked off of one KeyMaster Pro Server PC. One AI-SRVR-8 can accommodate eight AI-SRVR-1 devices. The system as shown would require eight AI-SRVR-8 devices connected to the KeyMaster Pro PC. The length of the cable will vary based on the scope of the project. However, in this diagram the CS-Net cable from the KeyMaster Pro Server PC to the AI-SRVR would be minimal since AAM is using the AI-SRVR's Ethernet port to make-up the majority of the distance run to the AC-4101 system controllers. The CS-Net cable is a Belden P/N 1624, 24 AWG CAT-5 TSP or equivalent. The Ethernet cable is a standard CAT-5 cable used by building network administrators. He stated that AAM would continue using the AI-SRVR in their projects. "With the AI-SRVR architecture for multi and remote building access control, all advanced "online" features can be employed allowing a more robust and flexible access control system," he said. "If this technology is utilized at the beginning of a large project, advanced features can be employed as needed or the addition of system controllers for extra access control points (more door/zone control) in the future is easier. This architecture also makes it possible to control multiple remote locations from a central site and single KeyMaster Pro Server PC."